Red blotchy rash on skin. Red blotchy itchy rash on skin. Red blotchy spreading rash on skin. My skin rash itches and is sore and scabbed up a bit but scabs are gone now and this rash is just sore. It is not spreading. 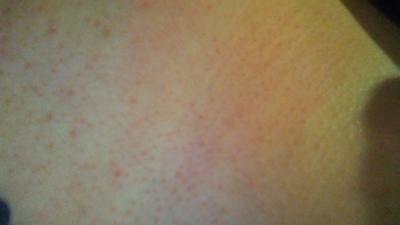 As the pictures of my skin rash shows, I have four spots. Below are submissions from visitors to healthy-skincare.com. 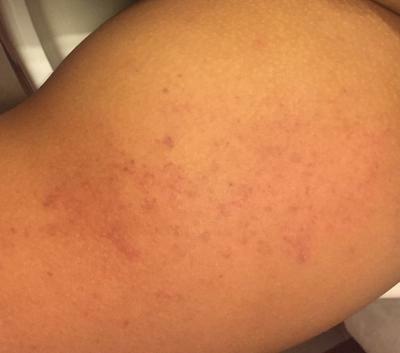 Please leave a comment if you can help diagnose the skin rash problem. Two nights ago I was awakened by intense itching all over my body from the neck down. I woke up again at six to feed my five month old and was still itching. I woke again at 8:30, and finally checked it out - red itchy small bumps all over. An hour later, they disappeared. Today I was sitting in church and it happened again, by the end of service, they were gone. I'm 32 years old and I was restarted on two medications two weeks ago but do not see any correlation with the timing of the rash. I have no change in soaps, detergents, or fabric softener. What medications did you start? Some medications can take a while to cause a rash. I have a rash that began on my stomach and spread to my hips, back, and chest within a matter of a day. I noticed it about a week ago when just my stomach was covered in little red bumps that were only itchy if I touched them. Then by the end of the day, it had spread to my chest and back. It isn't painful or dry. It honestly just looks like a bunch of little red bumps but I've never had this problem before so I know it's some kind of rash. My dilemma is I don't know what's causing it. I have not used any new soaps, detergents, medications or clothes. Nor have I eaten anything different than I always do. Itchy welts present on arm. 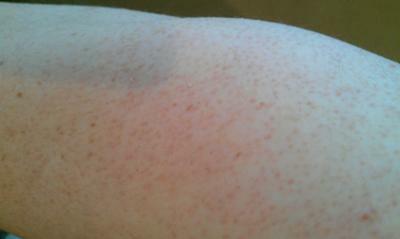 Itchy welts are present on my biceps and behind my knee. This skin problem started on my back after I used a sweat belt for the first time for a couple of days. Then, it spread to my neck and then, above my breast. Then, it spread down the sides of my breasts, in between them and under them and then, all over my stomach and sides. I thought maybe it was bed bugs at first but the bumps are not the same. It itches relentlessly. I have no clue what caused it. I thought maybe it was the belt so I stopped using it. Then I thought maybe it was an allergic reaction to the Brazil nuts I started eating, so I stopped eating them but it just kept getting worse. I want to find out what it is cause if its contagious, I don't want to spread it to my fiance and kids. My sister said it could be a yeast infection as well. I haven't come in contact with any plants that I shouldn't have. I thought it was a heat rash so I did everything I was supposed to do to treat that but it never went away. It just keeps getting worse. I rubbed olive oil all over my body to see if that would work as well last night. So far, no relief. Any suggestions? 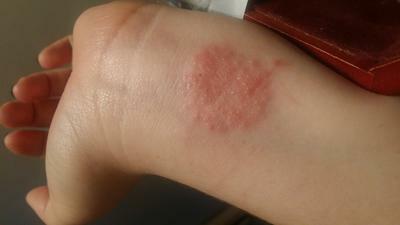 Red and itchy circular rash on wrist. Red itchy rash that keeps growing. Can anyone help me diagnose this rash. Likely a tinea infection otherwise known as ringworm rash. I had the same rash on the inside of my wrists and I tried everything. Cortizone 10 Intensive Healing Formula got rid of it in like 2 to 3 days. I think it was a heat rash because it has been super humid here in San Antonio, TX and when I went for a run, it got super red and burned. Dry flaky raised itchy rash in the crease of arm. 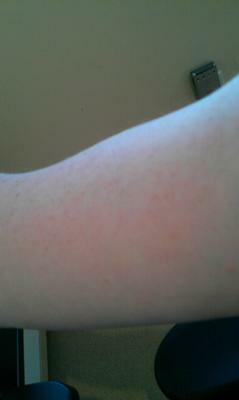 I have a very dry flaky raised rash in the crease of my arm its so itch. I have tried creams but it only seems to be getting worse. Also, I am starting to have the rash on my neck but it is not raised like on my arm. Skin rash on the side of stomach. I woke up one day with a rash on the right side of my stomach. It is itch only sometimes. It has been on my stomach for about a week. Does anyone have a diagnosis on what stomach rash could be? Red itchy rash on wrist with some blisters. Two or three days ago a small blister popped up and some little red bumps as well on my wrist and it is getting worse, but there are just two big blisters and a red rash. See the picture for a better description. Does anyone have any ideas on what this could be? Looks like shingles. Is it on one side of the body only? You should get it looked at. My daughter developed this rash after being in a swimming pool in Manila. I have numerous red welts on my arms and hands. I have had this for six years. They do not burn or itch but are very unsightly. They emit a stringy substance. I do not help the situation much by using tweezers to pull out the stuff. Nobody knows what it is. Anyone have such a thing? 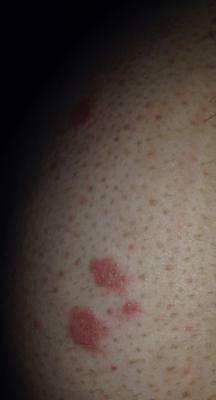 Inflamed itchy bumps on both sides of groin area after scabies infestation. I got scabies over a month ago, and during the time I was infested by the parasite I noticed an inflamed itchy bump on my hip and groin. It started spreading and I now have lots of those bumps. They are on both sides of my groin area and they itch so bad and become more inflamed when I scratch. This recently started spreading like this about two weeks ago. 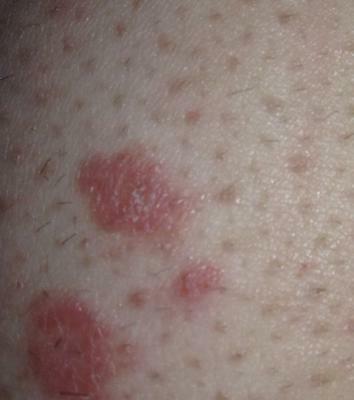 Unknown rash on the skin that has spread. I had a rash on my waist and it spread. It is worse when I get in bed and warm up. I was sure it was some sort of allergy but now my husband has started with it. We have no other issues and we feel well but we just have the rash. If the rash is only there when in bed or on furniture, I would advise to do a check for bed bugs. It would not hurt to check, but bed bugs do not discriminate. It looks like a rash I had when I had a bed bugs in my house. 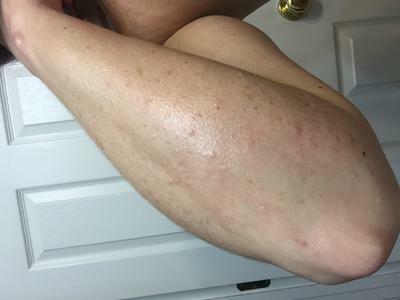 Red rash under skin on inner thigh. My four year old has a red rash under her skin on both her inner thighs. It does not itch, hurt, or burn at all she says. 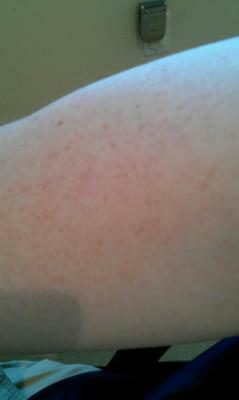 Picture of the red dots skin rash on my arm. Rash on my arm consisting of small red dots that are not itchy. I am 34 years old. 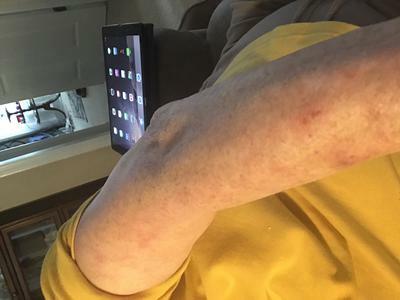 About ten years ago small red dots that look like a rash developed on the skin on the back of my arms and then one to two years ago the small red dots rash spread to the front of the arms as well as to the skin on my shoulder area. 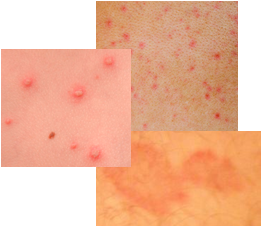 The small red dots do not hurt or itch and there are no other specific symptoms. I do notice that the density of the small red dots skin rash sometimes increases and sometimes decreases but the rash is always there and it never goes away. I would like to get some skin rash treatment suggestions or skin rash remedy suggestions of what to apply or what to do in order to make this go away? 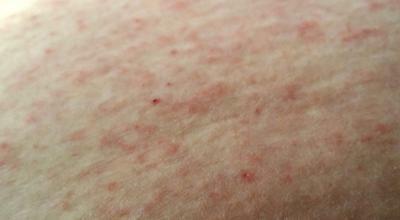 Also, does anyone know what this type of skin rash is and what may have caused it. 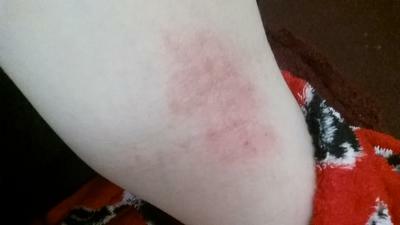 I have provided several pictures of the skin rash on my arm in order to help with the skin rash diagnosis. It seems like it's undiagnosed or not anything to be overly concerned about but there is my curiousity of what the cause is. I had this, only mine was accompanied with bumps. I started scrubbing it with a towel when I got out of the shower and then rubbed coconut oil on it and it went away. Good luck! I have had the exact same thing for years and I don't know what it is or how to get rid of it. I'm a 28-year-old female.